I met Ren several years ago during Let’s Make Christmas at Fortnum & Mason’s. She struck me then as being very organised and together. I expect this is probably a prerequisite if you’re going to publish a cookbook. We’ve not met since then, but we do chat online and I visit her blog, Ren Behan, regularly. Indeed, it was down to Ren that I finally bought a DLSR camera and started my photography journey – a slow one I know. Ren’s photography style reflects her recipes which are fresh, simple and beautifully presented. Ren has a Polish background and many of her recipes reflect this. I’ve tried several of them over the years and they always work. Her Polish spiced biscuits have become my classic Christmas biscuit. They contain honey, rye and cocoa powder, so as well as being robust enough to last for two weeks or so, they taste wonderful too. In fact they’ve made their way into Ren’s book as charmingly iced Christmas cookies. Wild Honey & Rye: Modern Polish Recipes is Ren’s brand new cookbook, it was only published on Thursday. The title sang to me immediately. I’ve been fascinated by rye since I first started making my own rye sourdough nearly eight years ago. As for wild honey, who could resist that? As the name also suggests, the recipes have been updated or created with a contemporary diet and lifestyle in mind. My knowledge of Polish food is pretty limited, so I was really looking forward to getting my hands on a copy as soon as possible. After a quick flick through, I was in love. The book is not vegetarian, but many of the recipes are or can easily be adapted. There are even some vegan ones to be found. It starts as all good cookbooks should, with breakfast. This is where my curd cheese with honey & walnuts on toast comes in. We all love avocado toast these days, but Ren’s version includes curd cheese and boiled eggs – what a feast. I’ve made apple butter before, but why would you want that when you can have Polish purple plum butter (powidła śliwkowe)? After a few days of toast and sandwiches, I’m finding the second chapter in the book, Seasonal and Raw Salads, incredibly appealing. Cucumber, soured cream and dill salad along with white cabbage and carrot slaw and a bowl of Polish salad with fresh market produce would do me very nicely. Pickles are not forgotten and I was excited to see a recipe for homemade fermented dill pickles in this chapter. I adore dill pickles and have often thought I ought to try fermenting them rather than preserving them in sugar and vinegar. Soups and Sides include various versions of beetroot soup and a tasty looking forest mushroom soup. Now I’m living in the New Forest, I’m hoping to forage some mushrooms, so this soup will be ideal. Light Bites and Street Food have me rather desperate to try vegan pastry rolls with sauerkraut and mushrooms. I am unable to resist a good pastry and the filling here sounds most intriguing. Food for Family & Friends would not be complete without Polish dumplings (pierogi). I had these for the first time only a couple of years ago and they were delicious. I’m really looking forward to making some myself. There’s a really useful how to do it section with a choice of fillings, including some sweet ones. I felt sure the chapter, High Tea: sweet treats and cakes was made for me. I’d very much like to try everything. Sadly, the cherry season is over now, but next year I am going to make the cherry crumble cake, it sounds fantastic. To finish off a rather splendid book, there’s a chapter on Fruit Liqueurs and Flavoured Vodkas. I’m very keen on my fruit liqueurs and have made a number of them over the years, but I’ve yet to try spiced honey vodka. There are lots of recipes I want to make as soon as I get the kitchen into some sort of order. Buckwheat and beetroot salad with feta, walnuts and honey might be first on my list. It sounds such an unusual combination, but I bet it’s delicious. With apples falling all around, I’m keen to make the apple mashed potatoes. Wow, what a brilliant idea. I’m thinking sausages and mash. Apple pancakes will also need to be made soon. Wild Honey & Rye is well written and beautifully illustrated in a style very similar to Ren’s own. As with most modern cookbooks though, not all of the recipes have photographs to show what the finished dish should look like. Don’t let that put you off. This is a book that reveals the deliciousness of modern Polish food and it will get used time and time again. Wild Honey & Rye: Modern Polish Recipes by Ren Behan is published by Pavillion with an RRP of £20. In Polish the name for curd cheese, honey & walnuts on rye is kanapki z twarożkiem, miodem i orzechami włoskimi. It looks interesting, but I think I need a lesson on how to pronounce it. Sadly, I haven’t been able to make any bread, rye or otherwise since I moved; all of my baking ingredients and equipment are back in Cornwall. I’m hoping to collect them in a couple of weeks, but until then I’m having to buy my bread. 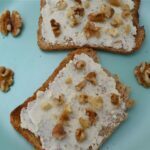 So far, I’ve been unable to find any rye bread so I’ve been making this recipe for curd cheese, honey & walnuts on rye with toasted wholemeal bread. Ren does say in the recipe to use rye or any other bread, so I don’t feel too bad about it. She didn’t say anything about toast though – oops! If I’d had my baking materials with me, I’d have had a go at the honey and rye loaf which is, very aptly, the first recipe in the book. I went looking for twaróg as I wanted to keep this curd cheese, honey & walnuts as authentic as possible, but I couldn’t find any of that either. Twaróg is a Polish soft white cheese made from cow’s milk. I ended up using a rather nice goat’s curd cheese which has slight tartness to it and complements the sweetness of the honey beautifully. It turned out that my runny honey was no longer runny. It is raw and quite delicious however, so I went with it anyway. Ideally, I’d have drizzled some over the top as per the recipe, but it was sweet enough for me and I didn’t feel I needed it. A couple of slices of curd cheese, honey & walnuts on toast make a substantial breakfast, but throw on a few peppery green leaves and it makes a splendid lunch too. Breaking News – after writing the above yesterday, I thought I should take a quick walk around Lymington Market before it closed. I’m so glad I did, because I found a fantastic loaf of real rye sourdough. I came back and made some curd cheese, honey & walnuts on rye. Delicious as the previous toasts were, it’s even better on rye. A delicious weekend breakfast, brunch or even lunch that's quick to make but feels special. Mix the cheese and 4 teaspoons of the honey together in a small bowl. Butter the bread, then spread the cheese mixture over the top. Drizzle with the remaining honey then scatter the walnuts over the top. You can top with jam or fruit preserve instead of the honey or with fresh fruit. It also works well with toast instead of bread and / or topped with peppery green leaves (Choclette). 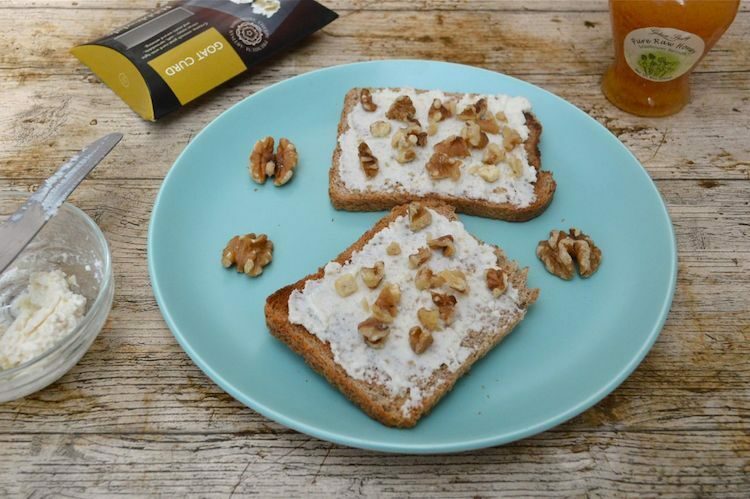 Curd Cheese, Honey & Walnuts on Toast. PIN IT. This book was sent to me for review purposes. Opinions are, as always, my own. The post contains affiliate links. Buying through a link will not cost you any more, but I will get a small commission. This helps keep Tin and Thyme blithe and blogging. It sounds delicious! I love Polish food as I lived there for a couple of years, although over 15 years ago now. I’d love to try some of the recipes in the book. I hope you feel settled into your new home soon too. I’ve had a couple of lovely weekends in the New Forest in the past and it would be a lovely place to live, especially for foraging. Thanks Corina. We found some mushrooms here a few weeks ago, but I’m hoping we’ll find more in October. How interesting that you lived in Poland. What were you doing? That’s a great looking open sandwich that I can enjoy every day! Wonderfully moreish toast! I love baking with curd cheese, but haven’t tried it on toast, must remedy that. It’s so easy to make curd cheese, I really ought to use it more. What sort of baking do you do with it? I’ve made curd tarts and they’re delicious. Thanks Ren. Your book is beautiful, in all senses of the word and a fabulous achievement. When I finally got hold of some decent rye bread, the cheese, honey and walnuts tasted even better. The New Forest is fantastic and I can’t wait to do some exploring. What a lovely snack, I’m definitely going to try this. I can imagine how these flavours go so well together. It’s become a firm favourite with me, especially when I finally got my hands on some decent rye bread. honey and walnut are some of my favourite flavours, can’t wait to try! Me too, but I rarely combine them. I must do it more often. I have to admit I’m not very adventurous when it comes to cooking but I love the sounds of this new book. It’s a really good one, even if you’re not that adventurous as it’s simple home cooking with delicious sounding recipes. the photos from the book look beautiful! I love walnuts, I really should cook with them more! Yes the photos are lovely. I never quite use them as often as I mean to either. I hope your move went well Choclette, this recipe and your review of Ren’s book really makes me want to get it. The chapter on high tea and flavoured vodkas and fruit liqueurs sound particularly good to me! There are just so many lovely recipes to try Margot. I have quite a few on my list too.